Benvenuti! Welcome at BeBop Jazz Club, Rome’s most eclectic music venue and probably the only jazz club in the world that is located in a building full of history (it dates back to the 1700s!). Glamorous dinners, music classes and amazing jam sessions, the perfect place to be if you want to experience jazz like never before! There are many music venues across the world, but very few are at the level of Rome‘s BeBop Jazz Club. Opened in the 1990s as a meeting point for Blues & Jazz fans in the capital city, BeBop is now one of the most important clubs in the country’s jazz landscape. After renewing its look in 2010 – history fans don’t worry, the venue still has magnificent signs of its belongingness to the 1700s – the joint is back, fancier than ever, to carry on and spread its love for jazz. The music genre, though, is not the only one being presented: Blues, R&B, Latin, Swing and Funk nights are on the nightspot’s schedule too. Not only music… in fact, it is not a rarity to find theatre shows and art exhibitions on the programme as well. In other words, if you like art, this is the place for you. To this you can add a friendly environment, a high-class customer service and variety of delights offered. Preparing their menus using hand-made craft – that we can refer to as ‘filled-with history and tradition’ – kitchenware, and using natural products, flavoured with the rare ‘scoglio della Sabina dop’ oil, they make sure that every dish served is a culinary trip into the Italian traditions. For those that wish to become members of the BeBop Jazz Club, the advantages available include music courses, taught by some of the élite Italian musicians. 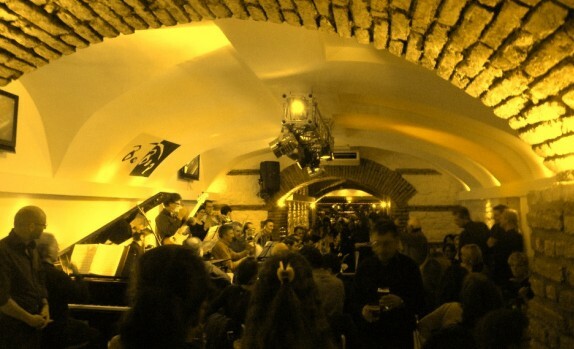 Where else can you experience jazz in 1700s venue that combines live music with traditional Italian delights and wines? Let’s talking about music. The venue presents a schedule filled with performances by local and national artists, to which concerts by international musicians are added. In addition, there are jam sessions that focus on different genres: Blues, Funk, R&B and Soul on Mondays, traditional jazz and swing on Tuesday nights and afro-cuban music on Wednesdays. Because of the venue’s notoriety, reservation is recommended (especially for having a ‘jazz dinner’). It is possible to have private parties, birthdays, weddings, seminars and all kind of celebrations at BeBop, so don’t hesitate to contact the venue. What more can we add? If you want to experience prime-quality live jazz, have a sophisticated and delicious dinner with a glass of Italian wine, BeBop Jazz Club is the place for you.